Living room painting "Aspiring Silver"
210x70x2cm Your hand-painted design picture. 160x70x2cm Hand-painted in our studio. 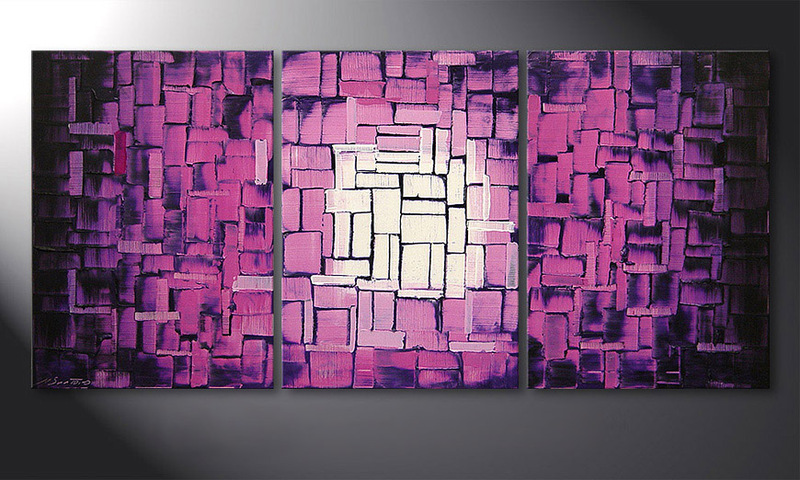 Living room painting "Ordered Confusion"
This wall picture Painting "Purple Afterglow" 150x70cm is a hand painted, not an art print. It consists of 3 panels with a width of 150 cm (without spaces). Purple is one of the main colours of this picture. Nick Santoro, also known as Christian Rose, lives and works in Potsdam. Together with Luise Zantopp, he is one of the co-founders and owners of Paintings XXL as well as the company manager. Nick Santoro is driven by his ambition for creating outstanding and ever improving wall art. His wall art convinces by versatile painting technqiues he has personaly developed. While he loves to playfully experiment with form and colour, his true passion however lies in the three-dimensional effects which complement most of his paintings. His paintings belong to our most valued wall art which is expressed continuously by the encouraging sales figures and positive reviews of our customers. The sides are painted in neutral grey. The painting is ready to hang. Sehr empfehlenswert, werde sicher weitere Bilder hier erwerben, da super Qualität zu einem unschlagbaren Preis! bonne représentation de la photo bien emballer parfait ! Sehr gute Handarbeit,besonders das Farbspiel im Licht gefällt uns gut,weiter so ,empfehlenswert! Lieferung war o.k. Wunderschöne Bild . Lieferung sehr schnell !